In a previous post, I explained how I successfully use a pair of XBee radios to exchange Midi information between a midi instrument and a computer. This post is about another wireless solutions for those who have an iPhone or iPad. The iRig Midi adapter fits the connector of any 30-pin iPhone or iPad, and will fit the new Lightning connector with the proper adapter. There are other adapters that offer similar connectivity, like Line6 Midi Mobilizer (which looks as it comes from the same design board/factory), and the Tascam iU2 (which rarely works at all)(update: Tascam has dropped the product after only a few months in production! ), but this is the one I chose. You could also try the iPad Camera Connection Kit if your Midi equipment only has a USB port. But as you might know, the Apple Camera Adapter is for the iPad only, so won’t work with the iPhone. It’s also a bit finicky about exactly what type of equipment you connect it too, and specifically how much power it requires. The goal here is to get Midi messages into the iPhone/iPad, and then send it to a computer. While there are many applications available for these devices (just do a search for “midi” in the app store! ), I just want something that will make the iPhone/iPad act as a Midi “Bridge”. iRig’s own iRig MIDI Recorder will let Midi thru (if you set the option to “on” in the setup area). 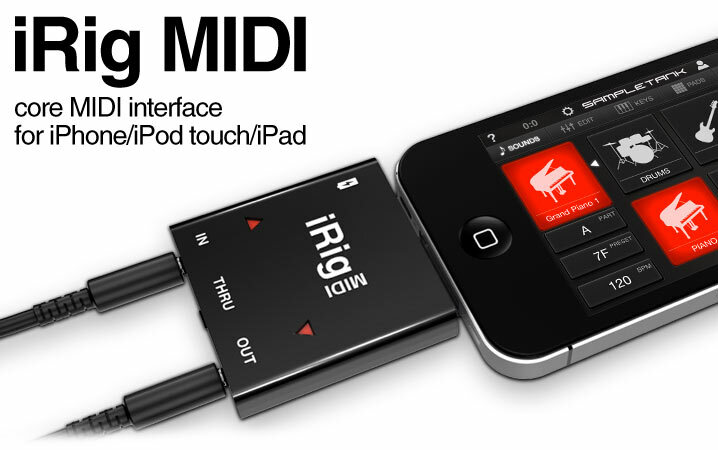 iRig Midi Recorder will also “record” you Midi keystrokes and replay them at will. The application is free with the device. 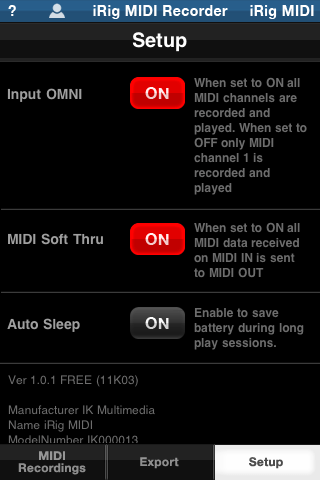 Another free application is MidiMonitor, from Domestic Cat. I use it to debug the Midi flow because is has a simple interface with lots of information about connection, midi sessions, core-midi status, etc. MidiMonitor used to let the incoming Midi thru to the computer using Virtual CoreMidi connections. Something has changed in iOS 6 and this does not work anymore. 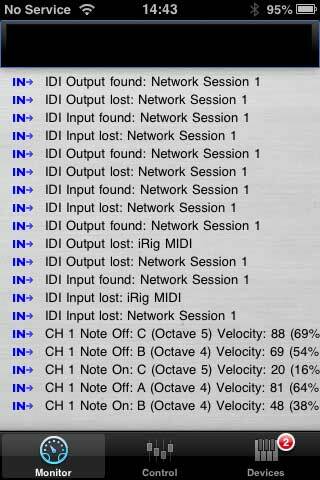 So while iRig Midi Recorder works as a Midi-thru core application, many other applications are hit and miss. Some of the developers have not updated their apps in months (years?). Audeonic.com’s MidiBridge iOS application works flawlessly as a Midi… bridge. It will take input from any Midi equipment recognized by the iPhone/iPad and send its Midi messages to other applications, including CoreMidi network sessions. This means that you can send any Midi messages to your computer AND use the same message on your iDevice in a compatible application. 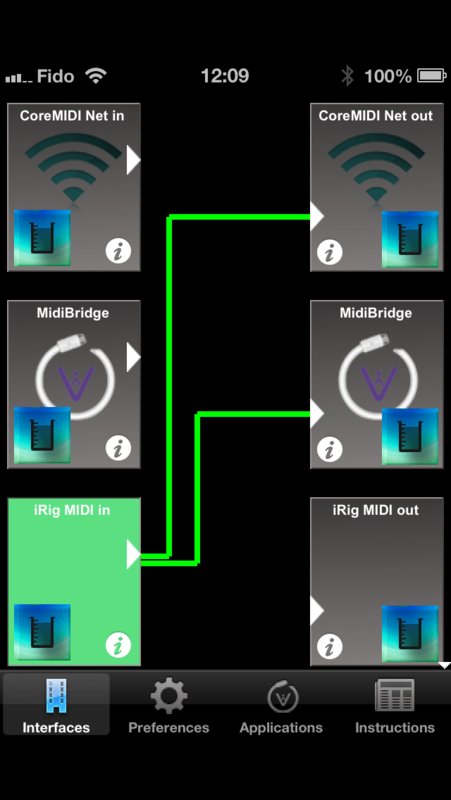 MidiBridge will also let compatible iOS applications send their own Midi signal along with the connected instruments. In this example, I have an iRig Midi connected to my iPhone. A Midi keyboard is connected to the iRig Midi and the signal is routed by MidiBridge to the computer through CoreMidi and is also available to any application that is compatible to MidiBridge. The application will also route CoreMIDI data from a computer to compatible applications or attached equipment. Using an iPhone or iPad to transmit Midi data is a very expensive way to do it if you have to buy the device. But for those (millions?) who have them, an inexpensive connector (the iRig Midi costs ~$70 and the iPad camera connector is ~$35) will let you exchange Midi both ways. There are also very nice applications, like TouchOSC, that let you do things that no other device can do, like transforming your iPad into an Ableton control surface. This entry was posted in Electronics and tagged ipad, iphone, irig midi, midibridge. Bookmark the permalink.